This film is primarily a fictitious story set somewhere in the Western Hemisphere concurrently around the earthly life of Jesus of Nazareth. 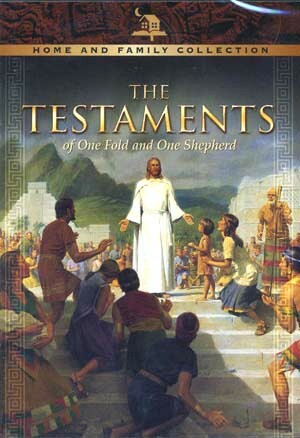 The Testaments begins with a statement admitting that the exact locations are not known, but assures its viewers that these events did in fact take place. The events referred to are naturally understood by LDS as being those concerning the life of Christ in the Old World, and after His resurrection there, His glorious appearing to the peoples in the New World. The actual events certainly don't refer to such things as the love story that develops between Jacob (Jeremy Hoop) and Laneah (Joy Rogers), or Jacob's dad's--Helam (Rick Macy)--quest to see the promised appearing of Christ. Intermittently, the story shifts back to Jesus' earthly ministry in the Old World, in which the viewer sees Christ's compassion in dramatically healing various individuals. The fictitious story in the New World begins with Amaron (Al T. Harrington) preaching Christ, but also a works righteousness that one must be stripped of envy or he's not prepared to meet God (cf. Alma 5:28ff.). Helam is a follower of Amaron, but Jacob is more concerned about the things of the world as it were. Kohor (Theo Coumbis) is an evil, powerful, and wealthy man, who hires Jacob to be his artisan. Kohor begins to give Jacob more responsibilities outside of being an artisan, and he is rewarded quite well. Fortunately, Laneah becomes a follower of Amaron's teaching, and because Jacob wants to marry her, he becomes at least open to believing it as well. Kohor invites Jacob to his secret society in which they conspire against the followers of the one God. (An interesting contrast is made between the monotheism of the good followers of Amaron and the polytheism of evil Kohor and those associated with him. This accurately follows the Book of Mormon in supporting monotheism (e.g., Alma 11:26-29), but it ironically doesn't follow the polytheism of Mormonism in D&C 132:19-20, and Abraham 4:1ff., Pearl of Great Price.) Jacob just can't go along with it, and Kohor imprisons Jacob. Christ's death causes a worldwide earthquake and storm, and actually blinds Helam as he saves his son. No worries though, since "pastey" Jesus beams down on the holy temple in the New World and He heals everyone's infirmities, including Helam's. Probably the biggest problem I have with this crowning event is that it just didn't happen, or at least there's absolutely no evidence for it. There is no evidence for any belief system such as Amaron's among the native Americans prior to Columbus. All the evidence descriptively points to the pagan belief system associated with Kohor, particularly with the suggested Central America cultural and geographical backdrop of The Testaments. No people, towns, or lands for the New World mentioned in the Book of Mormon have ever been found outside of it. And there is no evidence that these New World Israelites existed as "the principal ancestors of the American Indians" ("Introduction," Book of Mormon). All the evidence points to the native Americans being of Asian descent (cf. DNA vs. The Book of Mormon). For more on the archeological problems with the Book of Mormon see here, here, and here. Basically, The Testaments struck me as another cheesy religious movie. For more reviews and information on it, see here, here, here, here, and here. To watch The Testaments online, see here.